Windows 98 Unofficial Service Pack | DuncsWeb » Technology, Freebies, Gaming, YouTube. 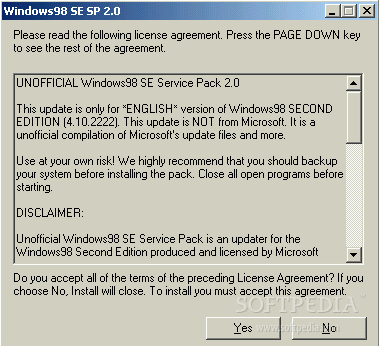 Microsoft has never released a service pack for Windows98 SE. But I made a Service Pack for Windows98 SE users. It contains all Windows98 SE updates from Windows Update site and more. It is a self-extracting and self-installing pack like Microsoft's update files. Thus, you cannot choice individual files. However, the pack installs only required fixes for your system. Uninstallation is possible from Add-Remove Programs. However, I don't recommend uninstallation of the pack, if you don't face any problem. This is *only* for WINDOWS 98 SECOND EDITION ENGLISH. I highly recommend that you should backup your system before installing the pack. You must have at least 32 MB of RAM. * Corrected timestamps of some files (2.1a). * Corrected SCR56.INF version information (2.1a). * Added COMPOBJ.DLL from DCOM98 (2.1a). * Added COMCAT.DLL from DCOM98. * Added Q285895 (CIMWIN32.DLL) and Q282949 (WBEMPROX.DLL). * Added Q314941 (SSDPAPI.DLL, SSDPSVR.EXE, UPNP.DLL). * Added Q887617 (HTML32.CNV, MSCONV97.DLL, MSWRD832.CNV). * Added a fix for VS2005 issue (REG). * Added "No Channel Logging" registry tweak. * Updated Q891711 (to U891711). * Updated NWPP32.DLL (to Q250876-v2). * Updated HTML Help (to Q896358). * Corrected MOUHID.VXD and DISPEX.DLL files. * Cleaned up some code. # 120+ updates and hotfixes (Detailed list will be prepared soon). # Solves 512 MB of RAM problem. # Better Notepad: MetaPad 3.5 (Optional). # Optimized swap file usage (Optional). # Better WDM and USB support. # Adaptec ASPI 4.60.1021 drivers (Optional). # Windows Scripting Host 5.6. # OLE Automation Libraries 2.40.4522. # Command Prompt Here (Optional). # New Animated Boot and Shutdown Logo (Optional). # Microsoft Layer for Unicode. # Visual Basic 5.0 SP2 runtime library. # Visual Basic 6.0 SP6 runtime library. # Visual C++ 6.0 SP6 runtime libraries. # Updates JET 3.5 files to JET 3.5 SP3. # Windows 2000/ME desktop icons. # Windows 2000 color scheme (Optional). # Supports custom "Program Files" directory. # Shows attributes column in details view on the Windows Explorer. I'm a 12 year old techie. If you can't spell it, don't write it. Thanks! I Tryed on VirtualBox and it Worked! Thanks Again Dude!